In 2005, I was commissioned to go into four schools and work with year six students to combine their efforts to create a wall mural at the Kensington Pool, Melbourne. The mural was unveiled on the day of the festival and every one present enjoyed a barbecue, played games and introduced themselves to their peers and older students from the schools they would be moving on to next year. The object of the exercise was to help foster a sense of belonging and community. 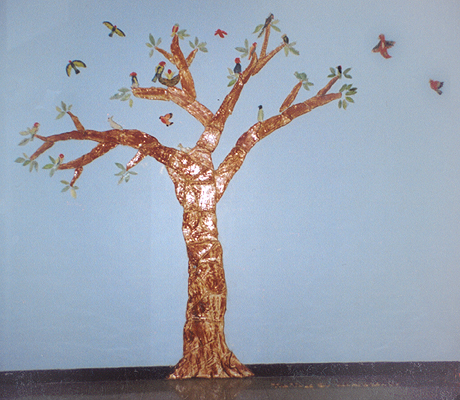 The children embossed individual images onto tiles of what their community meant to them and I used these to create an image of a tree to portray this. In 2005 I worked with students from the Leading Edge Program at the Albert Park College. The program was set up for the year ten student’s to provide leadership by creating projects that the year seven student’s could be involved in. 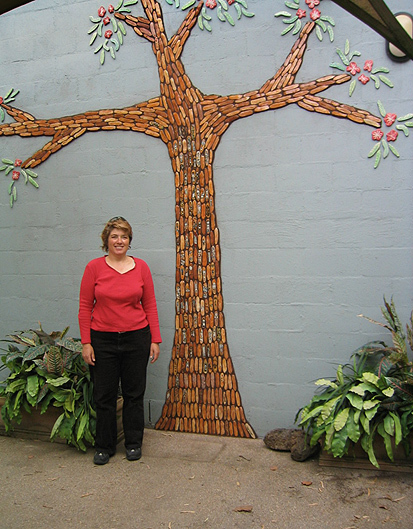 With the year ten students I made a three-meter ceramic tree from tiles. The year ten students using the skills they had learned then worked with the year seven students to create ceramic birds to add to the mural. The idea for this 2005 project started with a tree in the yard that had been cut down leaving the stump. It was decided we should make a sculpture with it and I thought we could create a wise old owl to sit on the log and oversee the yard. Over four weeks all the children worked with me making their own little owl sitting on a stump and these were then treated with oxides, fired and stuck on bamboo sticks. For the last two sessions the children worked with me rolling and joining coils as we built up and made the big owl. 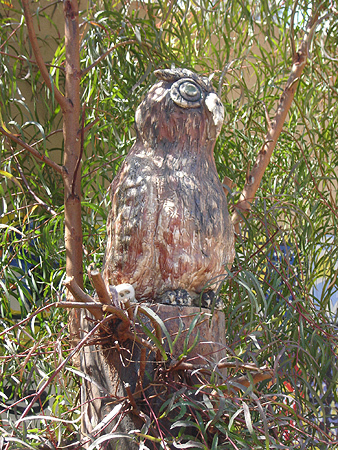 The little owls on bamboo were placed around the big owl creating an installation. In 1996 the Women’s Circus commissioned me to make a series of Altar Installations out side the Victorian Art Center – Forecourts for Celebrating Women. 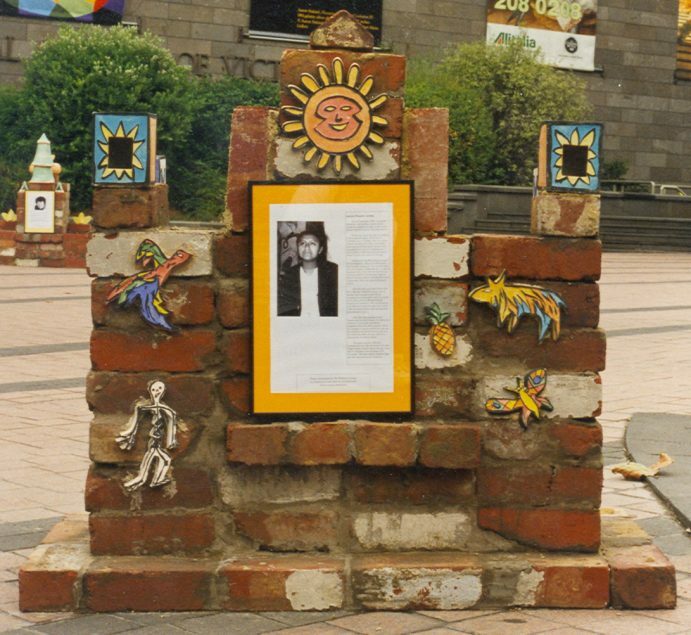 I constructed altars that commemorated the struggle of 12 women from around the world who were fighting or whom had suffered human rights abuse as part of the Amnesty International Human Rights Campaign. During the construction of the installation and on their completion Women’s Circus members performed in and around the altars bringing to life the stories of the women they represented through acrobatics and dance. 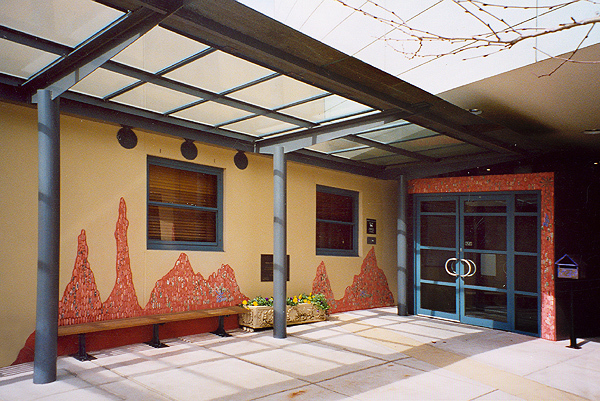 I was commissioned in 2002 as Artist in Residence to create a wall mural with the students of Wesley Prep school. Together we made close to 3,000 tiles and on two of those each child created an image of out back Australia which ranged from kangaroos, lizards, birds, trees, grasses, windmills, ants and all sorts of native wildlife. These were used to create a mural to celebrate The Year of The Out Back. Out of all the little elliptical tiles we made I created an out back scene of Ant Hills that now adorned the entrance way to the school.